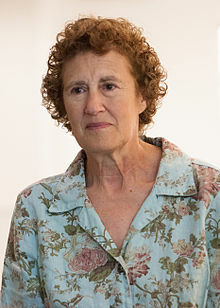 Barbara Jane Huberman Liskov ( born November 7, 1939 in Los Angeles ) is an American computer scientist. She is a professor of electrical engineering and computer science at MIT. In 1968, she received at Stanford University as the first woman in the United States the title of Ph.D. in computer science in 2008 and his second wife the Turing Award ( Frances E. Allen). Your bachelor's degree in mathematics received Liskov 1961 at the University of California, Berkeley. She then worked one year at the think- tank Mitre Corporation and Harvard University as a programmer, and finally at Stanford University as a research assistant in the AI field, until they 1968's with the work of A Program to Play Chess End Games by John McCarthy their computer science - Ph.D. obtained. She went back to 1972 to Mitre, then at MIT, where she was an Associate Professor until 1976 scientific assistant and until 1980 and since then has been a professor. Barbara Liskov introduced a number of significant projects, including the design and implementation of programming languages ​​CLU and Argus and the object-oriented database management system Thor. Together with Jeannette Wing, she developed the object-oriented programming significant Liskov substitution principle. Liskov was among others in the Computer Science and Telecommunications Board of the National Research Council and the Computer and Information Science and Engineering Advisory Committee of the National Science Foundation, and discussed, among other things Bolt Beranek and Newman, Digital Equipment Corporation, Hewlett -Packard, NCR Corporation and Prime Computer. Liskov is a member of the U.S. National Academy of Engineering and the American Academy of Arts and Sciences, and a Fellow of the ACM. In 2004 she received the John von Neumann Medal for "fundamental Contributions to programming languages ​​, programming methodology, and distributed systems" ( loosely translated: "Basic contributions to programming languages, programming methodologies and Distributed Systems" ), 2005 an honorary doctorate from ETH Zurich and 2008 Turing Award.